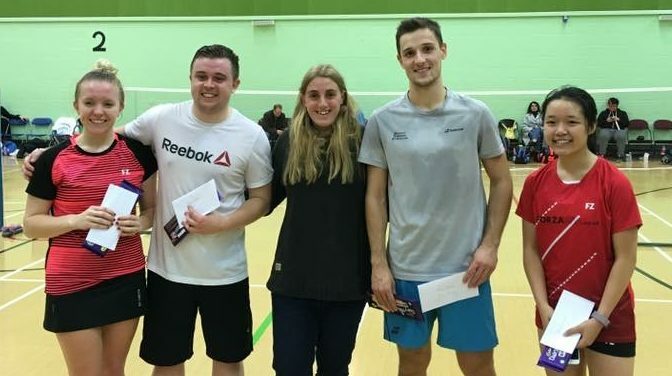 I competed in the Worcester Senior Bronze – 3 Nov 2018. Having never played together before, my partner Will Kitching and I got off to a good start in our box matches, winning comfortably and in straight sets. Onto the quarter finals, where we played Adam Hill and Zoe Siu where, we won 21-13 and 23-21, after being match point down in the second set. In the semi finals we played Matthew Stacey and Emma Hooper from Nottingham. A slow start in the first set meant that we lost to 15, however we eventually found our flow and won the match 21-17 21-16 in the second and third set. In the finals, we faced Adam Bowater and Evie Hamar (once again an almost all WMPC final!). It was an extremely competitive match and both pairs played well, we eventually lost out 15-21 21-15 15-21. Many positives to take from this tournament and I am hoping for continued success in senior tournaments this season!